With a mischievous smile, Lucho explains that we might get another 'replica'; an aftershock of the earthquake. Apparently on Monday night we had an earthquake of 4.5 magnitude, but Alix and I slept through it. The authorities on these matters predict a much larger earthquake will hit Santiago again within the next 12 months, and with the recent quake in Indonesia it would seem that the earth is scratching at her fleas with some vigour these days. Understandably, the earthquake is the great topic of conversation in Santiago right now. Just hearing the different stories of where people were and how they reacted when it hit is fascinating, and surrounded as we have been by a wonderful array of family and friends the opportunities to do so have been several. In a few short days we have met Lucho and Carmen's daughter, Daniela, and her family with husband Juan José and her six children. We visited Daniela at her beautiful home in Calera de Tango, where we drank lemonade and Juan José cooked BBQ pork- an excellent cut of meat they have here called malhaya, it is a thin, flat band of muscle that fits snug to the pig's stomach, and when cooked and salted it is lean and delicious. Daniela's house was quite undamaged in the earthquake, the only thing I noticed was a crack at the bottom of the swimming pool, which must have turned into a spa bath for a few minutes; when the quake was done the water level had dropped a foot or so from the spillage. 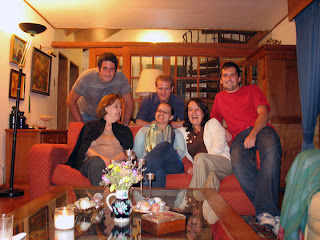 We have also had the opportunity to meet some of Alix' relatives here in Santiago; the human connecting power of Yahoo!Messenger allowed Alix to meet her cousin Diego in cyberspace for the first time in 2005, and we were delighted to be invited to Diego's family home in Las Condes for dinner. 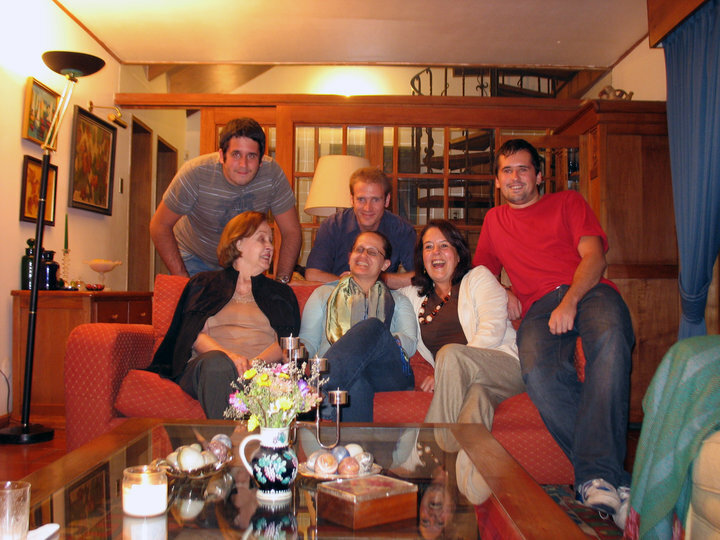 The photo below is Diego and his family. Diego makes a cracking Pisco Sour. Many of the museums and galleries a tourist might have visited while here are closed due to the damage the earthquake has caused, so instead of visiting the museums to see what is inside, you may visit them to see what happened to them instead. The other effect of the quake is a noticably large police presence on the streets, outside the Palacio de la Moneda there are police on every corner and more in two man patrols, there is even a riot bus casually parked a block away in a quiet side street. All this authority has obviously had a calming effect, the people in Santiago are courteous and polite, the city is an orderly commercial machine like most other big, productive cities. Piñera is, Carmen describes, "a technocrat. We are sick of politics in Chile. Chile has no need for politics, what has politics ever done for us? Chilean people just want to get on with their lives." In Santiago today you can see short term 12 month loans for 0.45% interest, so economic stimulation must be a high priority of the technocratic government. For the tourist the price of things, when compared with the knifing you receive at the cash registers of Sydney, Australia, is refreshing; two meals of steak or chicken washed down with a half bottle of excellent red wine served at your table with home made chilli relish and fresh crusty bread will set you back 8800 Chilean pesos, which translates to $18.39 in Australian money. Most noticeable is the price of fresh produce, with mestizo farmers coming to market each day in the old fashioned way and hawking their wares. On the streets of Valparaíso you can pick up very cheap fruit and veges, especially avocadoes which seem to be a local staple; they have several different varieties here and the cheapest price we saw was 12 kilos of avocadoes for 1000 pesos, or about $2.20 Australian. Guacamole for everyone! Apart from the avocadoes, Valparaíso, on the Chilean coast an hour and a half Northwest of Santiago, is quite an interesting place to walk around, the whole town is built into the sides of eleven different hills and the houses are seemingly all jumbled on top of each other like the city of Ankh-Morpork in Terry Pratchett's fantasy novels. Further up the coast, we visited the aristocratic playground of Zapallar, an exclusive sea resort where the beautiful people of Santiago spend their summers swimming and sunbathing, playing tennis and polo, and generally being pampered by life. Don Olegario Ovalle, a ranch owner who owned the Zapallar bay decided he wanted to create the Zapallar resort, so he contacted his 18 closest friends and made them an offer; he would give them free land on the coast on the condition that they would build their houses within two years. And so, the most exclusive resort in Chile sprung up out of nowhere inside of 24 months, and though there are more people there now, it has remained Chile's most exclusive ever since. Here we visited the summer house of friends of the Vargas', their beach-front mansion, in an old fashioned America-does-French-Country style, is a snapshot that appears frozen in 1905 when Don Olegario made the historic offer his friends couldn't refuse. Closer to Santiago is Isla Negra, the small town where Pablo Neruda, Chile's nobel prize winning poet wrote his poems in his wonderful house. Owing to Neruda's obsession with things nautical, the rooms of the house are designed to look like the insde of a ship and it is furnished with an astounding collection of bowsprits, ships in bottles, insects stuck with pins, navigation instruments and other interesting paraphernalia. If you want to see more you will have to visit; photography is strictly forbidden inside the house itself. Back in Santiago, Lucho kindly gave us a bit of a city tour, we ascended Cerro San Cristóbal and took a photo of Cerro Santa Lucía from the summit, somehow providing the impression that our time here was coming full circle as it complimented the photo of San Cristóbal we took from Santa Lucía some days before. From San Cristóbal we visited the architecture school of the Catholic University, the school is built into an traditional Chilean farmhouse that was built by one Francisco Antonio Avaria in 1780. This hacienda was owned by the Martinez family as a working farm when Luis, a friend of the Martinez', was a youth, and Luis remembers visiting here in its working days. The building was sold very cheaply to the University in 1952, it is a two-storied open square of white-washed adobe enclosing a courtyard orchard of orange trees, the perfect scene for a movie with sombrero gunfights or puffy-sleeved sword duels. The building must have been well constructed as it has only the same minor damage from the earthquake as the concrete structures elsewhere in the city. To land in a foreign country and be welcomed by family and friends has opened the gateway to our journey in the most wonderful and warm way, and has inspired us with confidence to explore this New World. Dearest Alix and Jace, I am touched and thrilled reading your wonderful blog. Thank you for sharing your excellent narrative and the great photos.